Newly Furnished Two Bedroom With Two Master Suites Directly Across the Kulalani Pool Recreational Facility! Property Size 2,673 sq. ft.
Price: It is a spacious home with a master suite on the main level, a master suite on the upper level, and three lanais. More than enough space for two couples or a family. Proximity: It is located directly across of the Kulalani Recreational Facility where you are mere steps from jumping into the refreshing waters of either their lagoon pool or lap pool, there are two hot tubs. an expansive exercise facility and a grand pavillion in the center of a park like setting. Presentation: This home recently underwent a refreshing transformation in April 2018 bringing in new furnishings and artwork that marry comfort and beauty to create the ideal tropical escape. The living area is furnished with a sea breeze couch and sofa, gorgeous glass top tables and a huge flat screen television. Uplighting lamps in the living room niche illuminate the room gently in the evenings as a tropical ceiling fan cools you from a twenty foot high ceiling. The gourmet kitchen is well stocked with everything you need for dining in. The built in barbecue grill is just steps beyond the dining area for ease and convenience. Indoor seating for four at the glass dining table as well as outdoor seating for four on the lanai welcome you with dining options. The main level master suite has it's own private lanai which has been thoughtfully furnished withe chaise lounges that coax you to stretch out and relax beside the golf course. A four post canopy draped king bed faces a wall mounted television, with a lovely set of nightstands and dresser. Even more space is available in the walk in closet that is set between the master suite and master bath. Dual vanities, a walk in shower and soaking tub provide you with everything you need. The powder room and full size laundry room are also on the main level. The two car garage is accessible and one garage is available for guest parking as are unassigned parking stalls nearby. A centrally located flight of stairs beckons you to the upper level where a second master suite awaits. A tryptic panel of ferns leads you up to a landing waterfall display, and the top of the stairs overlooks the main living area. 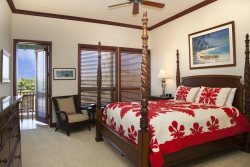 The upper level master suite has it's own private lanai with seating and ottomans for two, as it overlooks the Mauna Lani North Golf Course. This bedroom has a king bed, wall mounted flat screen, a set of nightstands, full size dresser and walk in closet. The master bath has dual vanities, a walk in shower as well as a soaking tub in a room adorned with a mesmerizing depiction of lava meeting the ocean and other artistic island delights. Beach gear including boogie boards, beach chairs, beach towels, snorkels and a cooler are stored in the garage for our guests. The Mauna Lani Access Cards provide you with entry into the private gates to enjoy the white sands of Makaiwa Bay. Kulalani 501 looks out to the 5th fairway and green of the Mauna Lani North Golf Course, it is a two minute drive to the Shops at Mauna Lani, and just steps from the Kulalani Recreational Center.